Visitors to the Hutchwilco New Zealand Boat Show at the ASB Showgrounds in Auckland from 14 to 17 May will have the opportunity to admire an original 1962 Fi-Glass Fisherman. Fi-Glass Managing Director Griff Simpson says that the remarkable thing is how little work was needed to prepare the boat for display as a special exhibit at this 60th anniversary show. “It was just a case of giving the boat a really good clean, doing a few minor-touch-ups, re-oiling the deck and replacing the crazed perspex windscreen,” says Simpson. The boat had been owned for most of its life by one family with Simpson purchasing it from its second owner four years ago. When the Fi-Glass Fisherman was released in the late 1950s timber boats were still the norm and the Fisherman’s innovative fibreglass construction was promoted as being lightweight and long-lasting, which it has unarguably proven to be. “Our promotional material at the time stated that the boat would last a lifetime and it is great to see that this is indeed the case”, says Simpson. Fi-Glass has been manufacturing fibreglass boats from its Christchurch base since Simpson’s father Frank founded the company in 1958. “My father discovered fibreglass overseas in Germany,” says Simpson. 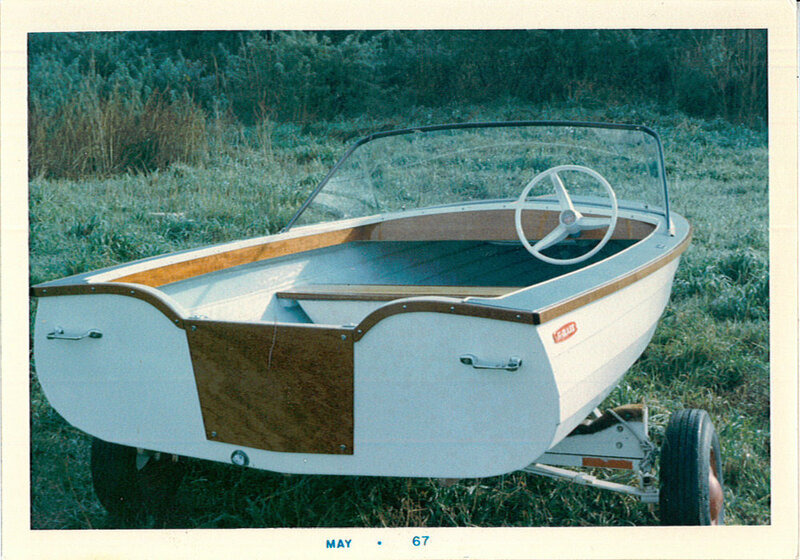 “With his background in yachting and boating he quickly saw the potential of fibreglass for boat construction.” Simpson says his father took a mould of a Clinker dinghy and used this to create the Fi-Glass Fisherman - a small, stable, all-purpose craft designed for fishing and water-skiing. The Fisherman was available in white, green, blue, yellow and red and featured mahogany and white pine laminated thwarts (cross-wise struts which can be used as seats, for those not familiar with boat terminology).